Homeschool Math: Head in the Clouds? Clouds weren’t named until 1803 when Luke Howard, an English pharmacist who was also an amateur sky watcher and weather buff, took it upon himself to give them their descriptive, Latin names. He named stratus clouds for the Latin: layer, cumulus for the Latin: heap, cirrus for the Latin: curly, and nimbus for the Latin: rain. So, for example, a cumulonimbus cloud is the name for a thundercloud, full of rain. Did Einstein have his head in the clouds, and should your homeschool math curriculum be there as well? Yes! 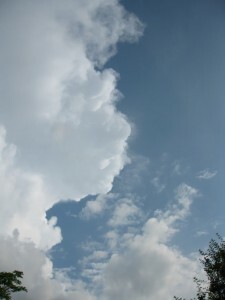 Consider that a low stratus cloud measuring about 0.6 miles on each side weighs about 200,000 pounds, or that a strong cumulonimbus (thunderstorm) cloud weighs about 2,000,000 pounds. Quite an engineering feat isn’t it? These gargantuan, heavenly structures manage to not only stay aloft, but to do so beautifully, gracefully, and effortlessly. This is how Einstein came upon most of his momentous discoveries and theories. His scientific career was based largely on happenstance and pure inspiration. As a patent clerk, he surreptitiously scribbled thoughts and theories, while keeping them hidden away in a desk drawer. E=MC2 had such humble but inspired beginnings! 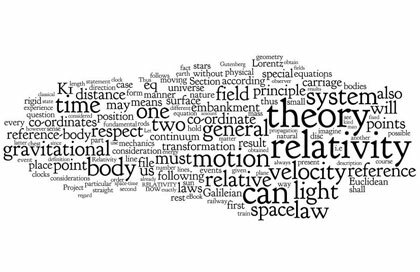 This “cloud” is made up of words from his book, Relativity: the Special and General Theory. 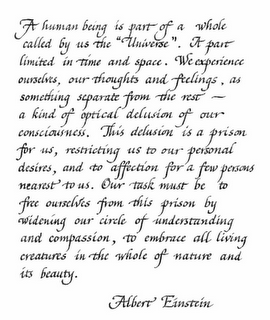 Imagination was the touchstone of Einstein’s work. He resisted the plodding, unimaginative approach offered in the schools and universities he attended. And since Einstein was a mathematician above all else, we can extrapolate that math itself should be based on the same intuitive, elegant, graceful qualities that made up both his body of work and the essence of clouds as engineering marvels. Nothing sparks your child’s enthusiasm, innate ability, and success in math like imagination! A hands-on experiential approach rather than a worksheet, chore-based format can supply the missing ingredient, while fostering a true joy of learning. It is also essential to success in math or any other subject to place the learning experience in a much broader, universal context. The piecemeal nature of most of the subject matter taught in schools is disjointed and alienating, whereas teaching through the whole or universal perspective empowers and engages the hidden genius in all of us. Once again, wise words! And ones we should take seriously when considering the way we teach our children. Open-mindedness and respect for all life should be the central tenet in any curriculum, as should respect for each subject taught. This respect should extend to the student as well, and be communicated above all else in our teaching. So, do base your homeschool math curriculum in the clouds! You, your student(s), and it will be in excellent company there.